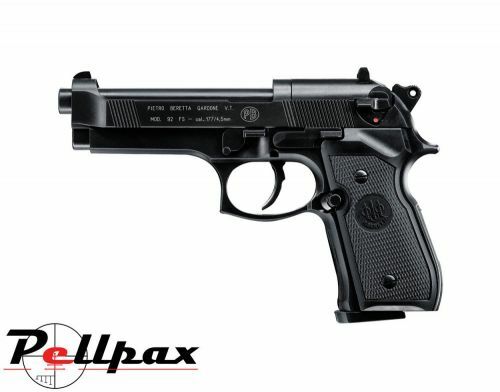 The Beretta M92 FS. Widely used throughout the world today by special task and Police forces and the armed services, the Beretta M92 FS has become legendary. A superb accurate copy has been developed, based on the original firearm and the result is a perfectly balanced sport and target pistol with smooth firing and high accuracy for those who want that little bit extra. The rifled barrel of M92 FS ensures the highest possible accuracy and is machined to an impeccable quality for a long lasting performance. The polished bluing of the pistol is of superb quality and gives deep colouration and finish. Comes complete with 2 x 8 shot magazines, all housed in a hard case.